From the 10 martyrs of the Lattimer Massacre to the election of Richard Trumka as the president of the AFL–CIO, Poles and Polish Americans have long been at the forefront of the labor movement. That struggle manifested in Buffalo when the workers of the Duffy Silk Mill went on strike and only the work of a magnanimous Polish priest could settle the strife. When the Duffy Silk Mill opened on Broadway in 1905, many Poles living on the east side of the belt line found work there. In the first 30 years of the plant’s existence, it was nonunion shop with 1,400 employees, 90% of which were women. Everything changed when the United Textile Workers of America began a campaign to bring 10,000 more textile employees into the union. 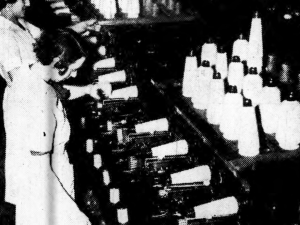 In early November 1936, enough of the employees of Duffy signed up to unionize the Broadway factory. On the morning of November 23, after a week of trying to get the management to recognize the union and a desire to have the plant return to National Recovery Administration standards, 800 workers walked out and began to strike. Within three days, 1,400 men and women were striking but repeated attempts to reach management went unanswered. By the beginning of December, the Duffy plants at 980 Northampton and 225 Guilford were striking and after a meeting at the Dom Polski, 100 workers of the Millfay Manufacturing Company began a strike of their own with a desire to join the Federation of Hosiery Workers. Soon the Dom Polski was hosting daily morning meetings of the federation and the United Textile Workers. The Duffy management continued its refusal to respond until December 8, when state mediators were able to talk with Paul Hemmerick of the company. Negotiations first got under way with the Millfay workers with the hopes that a breakthrough there would ease the tension at Duffy. Over the course of January in 1937, Dr. John P. Boland, head of the Regional Labor Relations Board, William Barrett, president of Millfay, and John W. Edelman, official representative of the American Federation of Hosiery Workers worked diligently to settle with Millfay while Duffy remained entrenched. After a marathon session of negotiations, the Duffy workers were the first to reach an agreement with management. The agreement came to pass after a three-hour session at the Dom Polski where national labor leaders spoke, but the key orator was Father Justin Figas of Corpus Christi Church. The three-year plan called for a 75% profit sharing agreement, reemployment of all of the former workers without discrimination, and the election of a trustee by the employees to oversee the distribution of the earnings. When told to the workers at the closed-door meeting, the cheers and shouts from the Dom Polski could be heard up and down Broadway. "800 Employees of Silk Mill Go Out On Strike." Buffalo Courier-Express [Buffalo, NY] 24 Nov. 1936: 19. Print. "Agreement Ends Duffy Silk Plant Strike." Buffalo Courier-Express [Buffalo, NY] 21 Jan. 1937: 1+. Print. "Conference Is Being Sought In Silk Strike." Buffalo Courier-Express [Buffalo, NY] 26 Nov. 1936: 18. Print. "Deeds-City." Buffalo Courier [Buffalo, NY] 24 Mar. 1905: 11. Print. "End of Millfay Strike Aim of Meeting Today." Buffalo Courier-Express [Buffalo, NY] 12 Dec. 1936: 30. Print. "Hosiery Union Official Here." Buffalo Courier-Express [Buffalo, NY] 5 Jan. 1937: 22. Print. Pinkowski, Edward. Lattimer Massacre. Philadelphia: Sunshine, 1950. Print. "Mill Wheels Turn Again." Buffalo Courier-Express [Buffalo, NY] 26 Jan. 1937: 11. Print. "Police Guard Millfay Plant After Disorder." Buffalo Courier-Express [Buffalo, NY] 2 Dec. 1936: 1+. Print. "Settlement of Millfay Strike Seen Probable." Buffalo Courier-Express [Buffalo, NY] 15 Dec. 1936: 10. Print. "Silk Workers Strike In Buffalo Factories." Lockport Union-Sun and Journal [Lockport, NY] 25 Nov. 1936: 2. Print. "Sit Down Plan Is Adopted By Silk Strikers." Buffalo Courier-Express [Buffalo, NY] 9 Dec. 1936: 1+. Print. "Trustee Lauds Plan In Effect At Duffy Mill." Buffalo Courier-Express [Buffalo, NY] 24 Jan. 1939: 20. Print.